This summer has been a special one in the garden. I have loved the lush growth that is a rarity in this usually dry prairie climate. The winter was a mild one thankfully and spring arrived early. There has been more rain than usual. Hops and clematis vines race around each other to take over trellis space, climb over fences and wrap around plants. Tall spires of Veronicastrum sibiricum wave delicately in cool, evening breezes while masses of lilies and daylilies are blooming their elegant hearts out. I think they are putting on a show just for me. What has become obvious is the urgent need to divide perennials. Last summer, there was some crowding but it wasn’t that apparent. Now it certainly is. The lilies are especially eager to burst forth and take over their compatriots. Where the Baptisia australis expanded at a glacial pace in past years, it has emerged as a plant thug this year. Who would have thought it capable? Perhaps I can go into yarn dyeing – I certainly have enough plants. Lest I stray off topic and wax enthusiastically about one of my all-time favourite plants, I would be remiss in failing to mention the perennially-beautiful Dictamnus albus (aka Gas plant). It put on a lengthly show throughout the spring. (shown below). Here is a small clump of Baptisia australis. Tulips have just finished blooming as has the Bergenia cordifolia. Last spring and summer, I did much less knitting than usual. I am making up for it now. 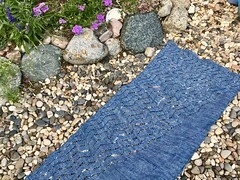 For the past few weeks, I took time out to block the shawls that I knit over the winter and spring. One of these days, I will take photos. It feels good to be back knitting shawls and enjoying it as I did in my early knitting times. Hopefully there will be knitting photographs coming up soon!